DETROIT, Mich. [June 3, 2018] - Rafa Matos secured his third Trans Am Series presented by Pirelli victory of the season today at the Chevrolet Detroit Grand Prix presented by Lear, successfully navigating the aptly named 3-Dimensional Services Motor City Dash which concluded with a one lap sprint to the finish following the third and final restart of the 75-minute competition. Matos, the current TA2 points leader and driver of the No. 88 3-Dimensional Services Chevrolet Camaro, began the race in second position but overtook polesitter Gar Robinson, in the No. 74 Palate of Milford/ 74 Ranch Resort Chevrolet Camaro, on the fourth lap of the race. Matos would lead the field through three full-course yellows over the 38-lap race and was consistently able to pull away from second position. The victory increases Matos' podium streak to five on the season and follows up on a second place finish in yesterday's competition to cap off a stellar weekend in Detroit for the Coleman Motorsports team. "Unbelievable. It's an unbelievable feeling," said Matos. "To put it all together, put on a good show and make no mistakes, and to be sitting next to these two drivers (Robinson and Francis) who are both champions, it means a lot. Hats off to my team; they made a great change in the car overnight and the car worked perfectly. I can't thank Doug Peterson enough; his support for our program and all of Trans Am is amazing. I'm proud to get this win for 3-Dimensional in Detroit; and hopefully we'll be back next year." While the one-lap sprint to the end may have been an exciting twist for those in attendance, the preceding caution had reeled Matos back into the field, erasing a lead that spanned multiple seconds creating a dash to the checkered flag following the restart. "It was a little nerve racking," said Matos. "I knew if I was able to nail my restarts, I would have a good chance to win. On the third, I was able to get a jump, and I knew I had the pace and just needed to remain mistake free." After being overtaken by Matos, Robinson would hold second position through the race despite multiple challenges by the No. 34 Mike Cope Race Cars Ford Mustang of yesterday's race winner Tony Buffomante. The second place finish was Robinson's second on the weekend, closing out a one-weekend-only return to Trans Am by the 2017 champ and 2017 Detroit race-winner and Milford, Michigan, resident. "I've very proud of my crew for their effort this weekend," said Robinson. "We've been excited to be back all weekend, and we've been looking forward to this for nearly a year now. I've got to congratulate Rafa on a great race today, and I'm happy with our result." Ernie Francis, Jr., in the No. 44 ECC/Anchor Bolt and Screw Chevrolet Camaro, would complete the Chevrolet sweep of the TA2 class podium with a third place finish to complete his TA2 debut weekend. Francis, the 2017 TA class champion and current TA points leader, battled clutch issues in yesterday's competition but was able to run within the top five throughout today's competition. Francis was in the position to capitalize on the final lap when the No. 34 of Buffomante was squeezed wide while attempting an overtake of Robinson and was forced to maneuver to avoid the tire wall, falling back to fifth position. The podium finish is Francis' first in TA2- following up on a TA class victory on the Belle Isle circuit in 2017. Jordan Bupp, in the No. 80 Bupp Motorsports Ford Mustang, finished fourth for his second top-five finish of the weekend while Tony Buffomante completed the TA2 top five. The TA2 class top ten was completed by, in order: Shane Lewis, Keith Prociuk, Paul Van Terry, Matt Parent and Steven Lustig. The race spanned a total of 38 laps, 13 of which were served under caution. 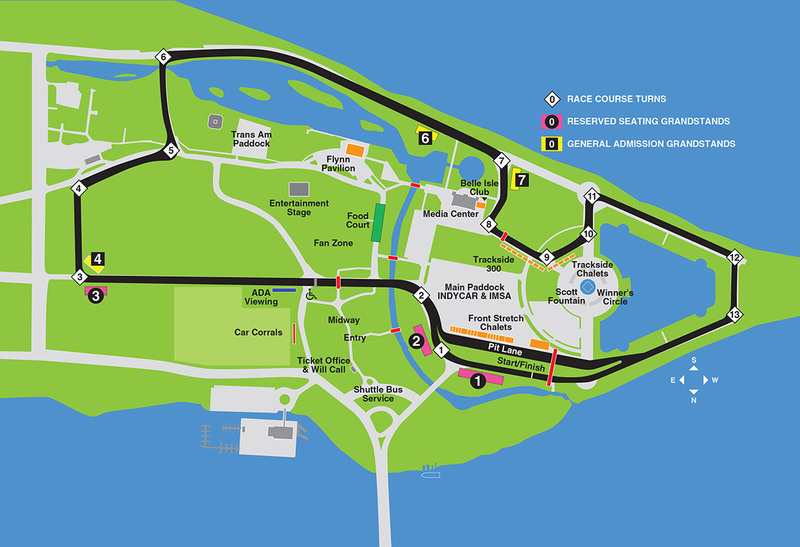 Matos would turn the fast lap of the race, a 1:35.479 around the 2.35-mile circuit on Belle Isle. Track conditions on Belle Isle for the compeittion were mixed following a mid-morning storm that left sections of the surface dampened. The Trans Am Series held an additional race at the Detroit Grand Prix yesterday, Saturday June 2, the full results of which are available at www.gotransam.com. The TA2 class and the rest of the Trans Am Series will return to action at Indianapolis Motor Speedway June 15-17. Fans can keep up with the Trans Am Series presented by Pirelli action throughout the season at www.gotransam.com, on Facebook at www.facebook.com/gotransam and on Twitter at @gotransam.